It's great to have multiple computers. On the first of them, you can install a database or crunch spreadsheets. On another, you can simply browse the Web, listen to music, and check your e-mail. Yet another can have a supercharged configuration for playing games. Sure, you could have all of your programs on the same, single computer, but some applications--such as games--can't run concurrently with other programs. 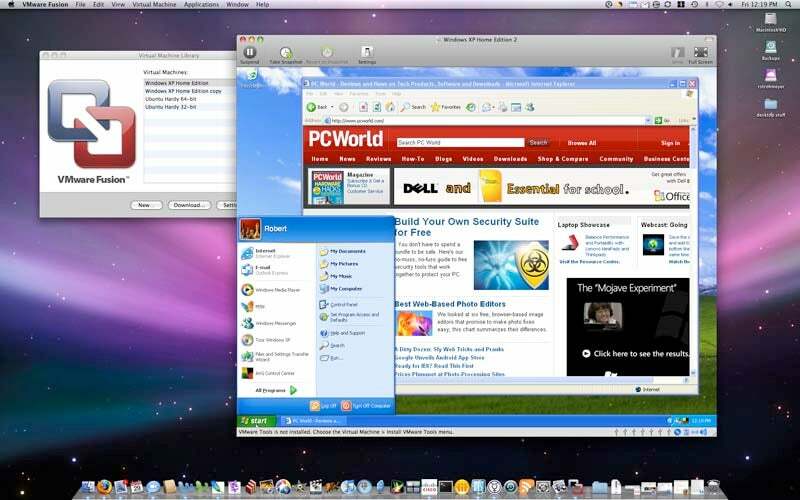 Apple won't let you run Mac OS X in a virtual machine on your Windows PC, but VMware Fusion makes running Windows on a Mac easy. Thanks to today's faster processors and capacious memory and disk space, however, you can get many of the benefits of using multiple, separate computers by adding virtualization software to a single PC. Such software lets you install multiple OSs into virtual hard disks that are really just files on your main hard drive. You can then launch and run multiple guest operating systems simultaneously. The software redirects access to key hardware devices on the host system, including network adapters and optical drives. Although the virtualized operating systems themselves are not always free, several excellent virtualization utilities don't cost a cent. VMWare's VMWare Server and Sun Microsystems' VirtualBox come in multiple versions that run under either Linux or Windows, allowing you to host either Linux or Windows. Microsoft's Virtual PC 2007, not surprisingly, runs only under Windows--but it does permit you to run Linux as a guest operating system, surprisingly. Other virtualization tools abound (notably, the Mac-based VMware Fusion and the multiplatform Parallels Desktop), but for this story I'm going to focus on three excellent, free virtualization apps as I guide you through the process of installing and configuring multiple OSs on your Windows PC. You can run just about any OS (except for Apple's, which is restricted to Mac hardware) in your virtual machines, and you can run the virtualization software on many different host operating systems. Virtualization is all about expanding your options. Though you'll see the best performance with fast processors, multiple gigabytes of memory, and large virtual hard disks, some virtualization tasks (including all of those described here) can run on systems with 512MB of memory or less. If virtualization doesn't meet your needs for whatever reason, or if you just aren't satisfied with a particular virtualization app, simply uninstall the software and delete the virtual hard-disk file to return your PC to its previous state.